Cricket Depth: Can cricket be made safer? Can cricket be made safer? With the recent injury to Mark Boucher forcing him to retire from International cricket, it has posed questions to some as to whether cricket is safe enough and whether there should be more regulations put in place to reduce the risk of injuries like this recurring. 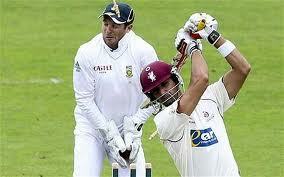 Boucher received this injury when standing up to the stumps when keeping to Imran Tahir. However why when these injuries have occurred in the past to keepers especially, do they not choose to wear a helmet? Also it could be questioned as to whether keepers must use a helmet when standing up and not have the option to avoid wearing head or face protection. If Boucher was wearing a helmet it would have reduced the chance of he bail getting through to his eye along with minimising the risk of the ball in general striking him also? So why do they choose not to wear them? system where I was forced to wear a helmet in junior cricket I now would not bat or keep up to the stumps without a helmet as I wouldn’t have the confidence to play without one. If young cricketers see keepers up to the stumps with no helmet then because of the influence they have on them, they will replicate this and want to do the same when they reach 18 and are allowed to choose. So why does the ICC not enforce a ruling where all keepers must wear a helmet or face grill up to the stumps and all batsmen must wear a helmet regardless of the pace of the bowler. There is an argument that the batsmen chooses not to wear a helmet at their own risk and generations before them never wore helmets and the majority were fine however why take this risk when there is so much at stake. If it were me I would reform these rulings and make helmets mandatory as it would lessen the amount of injuries like this comprehensively. There are of course freak injuries like that of Peter Fulton where there helmet failed in protecting the batsmen when he was netting against a bowling machine set at firing out the short ball however this is a freak injury and it is proven that helmets reduce the impact and even save lives. Players shouldn’t have the option to take the risk in my opinion as all professional cricketers are able to use a helmet against pace bowlers, so why are helmets not adequate against the pace off options or when standing up to the stumps. Helmets give players more than adequate view and are lighter than ever with the introduction of titanium grills and so the risk should be lessened and all players must wear a helmet so that the injury suffered by Boucher never happens again and no other cricketer’s career is ruined as a result of lack of protection.